Keen and alert, the Sealyham Terrier is all terrier. This small dog breed embodies power and determination. The breed was created to hunt badger, otter and fox but today they make an excellent family pet. Sealies still love to take part in earthdog competitions whenever possible. Sealies love their family but they are very active and spirited, so they need activities to keep them busy. They usually relax and become calmer with age. The Sealyham Terrier, or Sealy, takes his name from Sealy Ham, in Haverfordwest, Wales. It was the estate of Capt. John Edwards, the man responsible for creating the breed between 1850 and 1891. Edwards created dogs who could hunt badger, otter and fox. The dogs had to have extreme gameness and endurance and as much substance as possible for their small size. To create the Sealyham Terrier it’s believed he used the Corgi, the Dandie Dinmont Terrier, the West Highland White Terrier, the Wire-Haired Fox Terrier, the Bull Terrier and maybe even some hounds. The Sealy quickly caught on. They first appeared at a dog show in 1903. The Kennel Club recognized them in 1911 and the AKC recognized them in 1911. Today, this dog breed still makes an excellent family companion and they are often seen at earthdog events. The Sealyham Terrier is a loving and affectionate dog. They are loyal and very attached to their owners. Like many terriers, they can be quite independent and spirited. They are also very courageous. They are usually very active dogs, especially when young, but they will relax and become calmer as they get older. They tend to be reserved and aloof with strangers. They will bark to give an alert, so they are decent watchdogs. The Sealy is typically good with other pets if you socialize him with them from a young age. They usually get along well with other dogs. The Sealy usually loves children and does very well with them, especially older children. The Sealy isn’t usually as feisty as some other terriers so if you’re looking for a calmer terrier, this dog may be a good choice. Living Environment – The Sealyham Terrier makes an excellent apartment dog. They are small and, as long as their exercise needs are met, they will be quite happy in an apartment. They also enjoy having a small yard of their own. They are great mousers so any vermin in your yard will be in danger. These dogs do not make good kennel dogs and they need to be with their families. Grooming – This dog breed does require some specialized grooming. They need to be brushed a couple of times per week to remove any mats. They should also be trimmed monthly to keep them looking appropriate for the breed. This is usually done by a professional groomer. The coat needs to be stripped instead of clipped so it will keep the right feel. Bathe as necessary with a shampoo for wiry coats. Diet & Exercise – The Sealy is prone to putting on excess weight so, after they are adults, their weight should be carefully monitored and their food fed in careful portions. Make sure this breed gets enough exercise. When they are young they are very active but as they age they will grow more sedentary and you may need to make your Sealy go for walks. He needs the exercise. Health – These dogs can be prone to several health problems, including primary lens luxation, skin problems, epilepsy, back problems, cancer and deafness. 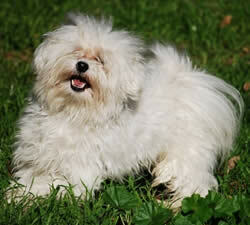 If you are interested in this dog breed you should talk to a breeder about possible dog health problems. The Sealyham Terrier can be somewhat difficult to train. It’s important to start socialization and dog training early. These dogs can do well in earthdog events and other dog activities but you will need to find ways to motivate them. Use positive dog training (praise, reward) and try to make training fun for them.